Toolbar to launch SprutCAM(TM) from Rhinoceros(TM) with current project. This addin showed as button with SprutCAM icon. You can use <SprutCAM(TM) addin for export Rhinoceros(TM) data> for import Rhinoceros(TM) project files. File extensions 3DM, RWS, 3DS, STP, STEP, RAW, WRL, VRML, AI, EPS, LWO, SPL, VDA, DWG, DXF, DGN, SLDPRT, SLDASM are supported. Note: Rhinoceros(TM) version 3 or 4 / 5 are supported. 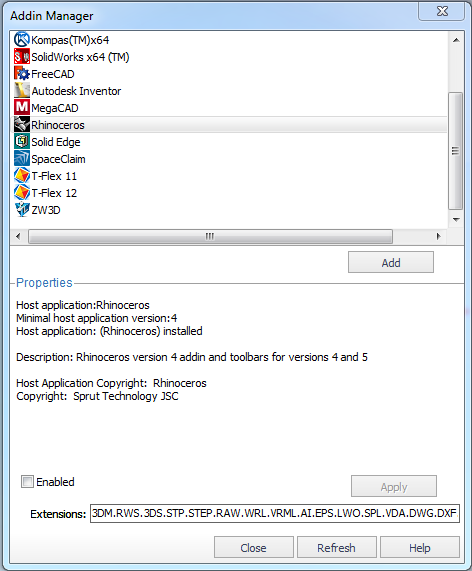 Note: Rhinoceros(TM) version 3 must be SR3c (build 21-apr-2004) or later. Note: You must have Rhinoceros(TM) installed on your computer before setup this toolbar and addin to use import.